The feeling at spring training isn’t quite the same as a day at the ballpark anywhere from April to October. It’s still baseball, but the final score is primarily irrelevant. It’s all about baseball being back in the air, players taking extra grounders and fly balls, young prospects proving their worth, and so forth. When you first step foot onto the Minnesota Twins complex in Fort Myers, Flordia, you’re welcomed with a parking lot that has parking lanes named after Twin greats. Walking down the cement plaza fans can see the field, Hammond Stadium, off to the right. To the left is where much of the work is completed and progress is made. Practice fields are all around, and everywhere players are tuning their skills for the season ahead. On Tuesday, I was in attendance as the Twins took on the Baltimore Orioles, and while the team lost, there were several things to take away from the event. ** In the lineup after taking a few games off was catcher Joe Mauer. After his introduction, he was enthusiastically welcomed by the fans. Hitting just like last season, Mauer twice took some pitches and then solidly drove a pitch to the outfield for a hit. Other lineup mainstays played too. Michael Cuddyer especially stood out. Three times he smoked fly balls to the outfield, and all three times he was retired (including a few very good catches). ** Scott Baker looked great on the mound. The first pitch of the game was taken to left field for a base hit, but otherwise Baker had good control and put forth a solid four-inning outing. ** Several prospects took the field in the loss: Juan Portes started, and despite a hitless day, he hit a few balls hard to the outfield and definitely looks like a guy to watch. Ben Revere has some incredible speed. Danny Valencia, although in a short viewing, looked like a capable defender at third base (he made a nice stab on a line drive). ** The first thing to see upon arrival was manager Ron Gardenhire and former manager Tom Kelly behind the plate with their fungo bats and the infielders taking grounders. The spring feel showed again with Gardy joking with the players and everybody pretty relaxed. The day’s session seemed to end with pitcher’s fielding practice. A majority of the pitchers practiced coming off the mound to field grounders and they ended it by lining up between first and third and simultaneously faking throws to the mound from the stretch. ** Jon Rauch is really tall. Everybody knows the righty is 6’11, but Rauch really towered over basically everybody during practice. Carl Pavano (6’5) looked most normal standing next to the team monster. ** Gardy has nicknames for everybody as many know, but it seems as if the trend extends to other coaches too. Rick Anderson was yelling various names out during pitchers fielding practice as he threw baseballs to the grass for pitchers to throw to first base. Two that were clear enough to hear were Frankie for Francisco Liriano (it seemed many people called him this), and Pav for Pavano. ** The atmosphere and general feel of these games is definitely unique. The outcome is far from important, and many fans are there simply to take in America’s pastime on a sunny afternoon. It’s funny to hear fans say to themselves, “Who?” when players wearing the 70s, 80s and 90s on their uniforms enter the game. ** It seems to be quite the spring for attendance at the team’s spring home. 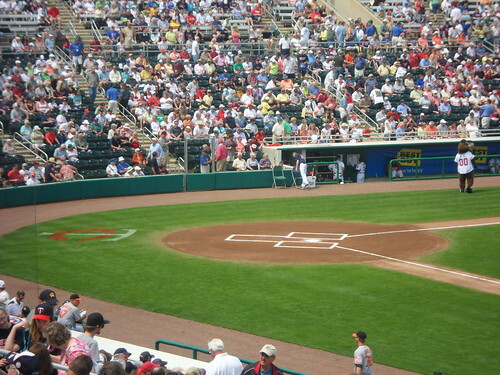 After breaking the single-game attendance record against the St. Louis Cardinals one week earlier, Hammond Stadium saw another record crowd for their matchup with the Orioles. That record apparently didn’t last long either though, a new record was set on Thursday against the Pittsburgh Pirates. 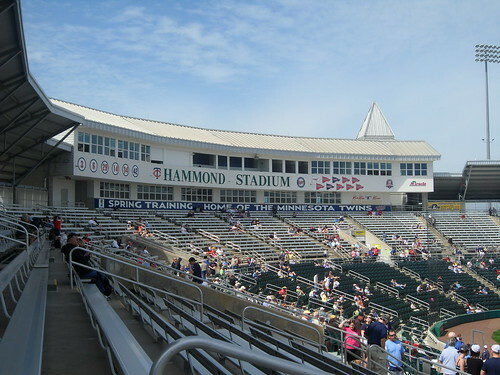 ** It’s hard to judge without going to other games at different parks around Florida, but based on seeing the Blue Jays ballpark from the street and the Twins’ complex in person, it seems as if Hammond Stadium and the surrounding fields have to be one of the better spring training complexes. It’s easy to get close to the action on the practice fields, and it’s a pretty nice place to watch a game too. Spring training without a doubt has a different feel. Watching the players take grounders and practice like any high school or college team would is interesting, and it’s great knowing baseball is right around the corner.